- I was told that Cousteau's first triple tanks used the 3rd tank as a "Decanting" reserve. They'd be diving off the other two tanks until empty, then open the valve from the the reserve tank to "decant" more air into the other two... until all three were the same pressure. Then close the valve on the third tank. Again, they'd keep diving the other two tanks until empty, then open the reserve until the tanks balanced again and close the valve on the third tank. This system allowed them to know how much they had left toward the end of a dive without having a pressure gauge. You can do it too, with TWIN Tanks and a J-Valve! - After a really good re-build of the reserve mechanism on my Twin 38s, I was able to "Decant" from one tank to the other. I did it while diving at Sea Hunt Forever but only for 2 pulls and I didn't track how much time I got from each pull. - Last week I re-built the reserve on ANOTHER set of twins (my "Bill's 38s"). Did it the same way and yesterday we tested it at the pool. The first pull gave me 8 minutes. Second pull gave me 3-4 minutes. 3rd pull 1-2 minutes. And 4th pull about 30 seconds. But even that last pull went from sucked dry to 30 seconds more of normal good breathing pressure. 1. The J-valve orifice and seat must be clean and smooth. I used 0000 Fine steel wool on the end of a pencil eraser to polish the orifice. Then, I blew out any dust or debris with HP air. THEN, I used a Q-tip and paper towel moistened with food grade silicon spray to wipe any remaining particles from the orifice. 2. I replaced the seat with a NOS seat I was fortunate to acquire from Captain Tom. 3. The spring may or may not need replacing but take note of any little washer/spacers. These are used to tighten/adjust the spring tension if you need it. You can test this now: Blow with just your lung pressure into the tank and flip the lever closed. Listen to see if it leaks. Flip the lever open to see that the reserve releases properly. If it leaks when the lever is closed, you may need a better seat, orifice, spring, or another spacer to tighten the spring. Vintage Diving Technique are Why I Got Back Into Diving. Without a pressure gauge unless you know exactly how many times you can decant from the reserve tank and still have sufficient air to safely finish the dive from a given depth you could end up decanting yourself out of air. A J reserve is not depth/pressure compensated, it doesn't know if you are at 10 feet or 100 feet when you pull it. You need to maintain the equalized pressure above ambient depth pressure in order for the regulator to supply air. Once the equalized pressure is is the same as the pressure depth you are at you are essentially out of air at that depth. This would be the same as using a tank with no reserve and breathing it empty. The only air then available is that which becomes available as you rise into a pressure depth less then tank pressure. I totally agree with what you are saying. There is only one J valve (that I am aware of) that actually has a depth compensated reserve pressure. That would be the Scubapro DCAR valve. The DCAR stood for Depth Compensated Adjustable Reserve valve. The reserve mechanism has a small orifice on the top that allows water pressure to push directly on to the reserve valve plunger. On the top there is also a slotted small part that can be pushed down with a screw driver and turn 90 degrees. That will double the reserve pressure from 300 psi above ambient to 600 psi above ambient. In at least one of the catalogs, I remember reading that the extra reserve pressure would be useful for cave divers. I think that was a stretch. It is a neat valve, but I don’t know any other like it. 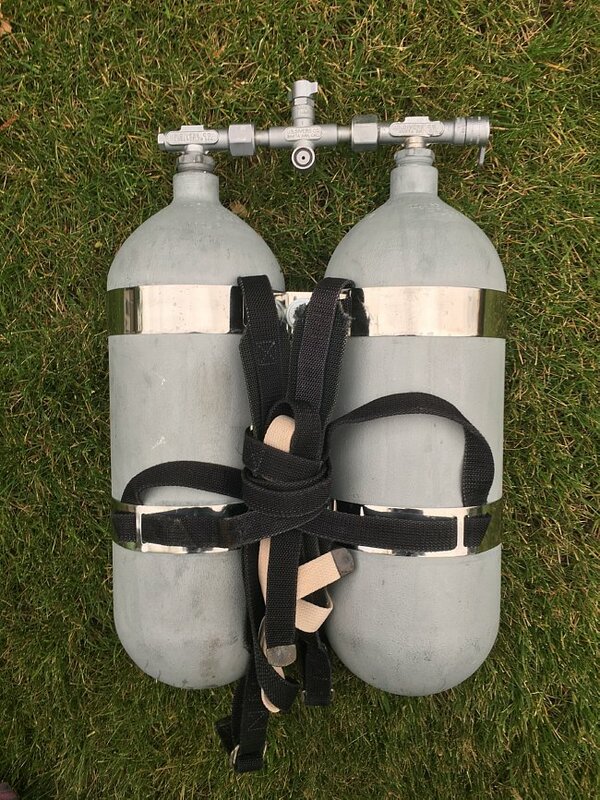 On the subject of pressure compensate reserve, it is amazing that I have run into several divers that would debate (or even argue) that all J valves are pressure compensated. They are basing their argument on something they have read on Roberts (Basic Scuba) book. I haven’t read the sentence in a long time so I can’t remember what it says, but the claim is that because the regulator is pressure compensated, the reserve behaves as pressure compensated (or at least the interpretation of those divers). Your explanation as it being the same effect as running out of air with a K valve is right on target. Buceador con escafandra autónoma clásica. - My reason for posting this comes from my surprise that its possible to have a J-Valve that seals well enough to decant. - I've heard, read, and experienced many accepted opinions on how twin tank reserves are supposed to work. Since all of the twin tank reserves we see nowadays are old, they don't often reveal how well they can and should work. - I've purchased old twin tanks where the reserve was set and the tanks were full. And when I emptied the tanks, the reserve tank still held a good deal of pressure with no leaks. And, I had to pull the lever to completely empty the tanks. - I've also had reserves that would slowly leak from the reserve tank to the other tank... Sometimes so that when you needed to pull the lever, there was nothing left in the reserve tank. Other times there was still SOME air in the reserve tank. And others where if you breathed gently enough, you'd actually keep up with the leak from the reserve tank and end up with both tanks empty without pulling the reserve lever. - I've been told that the reserve seat is SUPPOSED to leak. That you're just supposed to detect it getting harder to breathe. - My favorite "Twin 38s" had a reserve that (I thought) worked pretty well. But, I knew the seat leaked somewhat. Imagine my surprise when I took it apart and discovered that the spring was broken and it had 3-4 extra spring tightening spacers. The previous J-valve technician must have used the spacers to adjust the reserve too tight, causing it to break. I don't know why it worked for me, but now I had to repair it. - Fortunately I had a spring from another manifold and a new seat from Captain Tom. I put it all together without the extra spacers. And it works perfectly. With the lever up, the reserve tank does not leak into the second tank... Not even if the second tank is empty. What Made Me Think of Decanting? - Near the end of my second 30 minute dive at Sea Hunt Forever, I ran out of air, pulled the reserve lever, and ended the dive a little early. When I checked the tank pressure after the dive, I still had 300 psi total in both tanks. These old tanks hold a lot of air at low pressure. 300 psi in two 38s is around 10- 15 minutes of dive time at these depths. I could have finished that dive with 10 minutes to spare. - So, I figured the next time I ran out I would try pulling the lever to decant the reserve, then pushing the lever back up to see if it would give me a second reserve. And sure enough it did exactly that. - My understanding is that a twin tank J-valve is really just a spring powered over pressure valve that you can manually open. When its not manually opened, it causes up to a 500 psi difference between the reserve tank and the other tank throughout the dive, regardless of depth. You can pull the lever at any time or depth and hear the air equalizing between the tanks. - I read the info in Basic Scuba and Here's How I Understand it: If you pull the lever when you're deep, the reserve air will expand and give you more as you come up. If you pull the lever shallow, the reserve air will compress and give you less if you go deeper. Is this correct? I will say that the USD J valves all seal and operate correctly if they are serviced right and the seat isn't shot from 50 years ago. i have 2 sets of doubles and 4 steel 72's and they all have functional J valves which I use for actual diving without an SPG. The doubles come with a 500 PSI spring and the singles a 300 PSI spring. They can also be swapped so you can have a 500 PSI reserve single valve if you so desire. I've done some legitimately deepish technical profiles with double 72's and a double hose. I even took the second day of my deco class in 2010 in all vintage gear with a horse collar and a hang bottle. If it's a single stage regulator it gets a little thin below 150 on air. I don't know how the calypso guys used to dive them that deep but then again they were often using mixed gases with less density. The USD j-vlave seat is predominantly just a soft seat against a hard orifice, much like a DAAM first stage. The later Voit ones that are not rebranded USD valves are junk. I've never seen one work right, and the seats turn all gummy and fall out. I'm not sure about the other brands. USD ones are solid though. Even the early USD metal seat j-valves that ping when you use them work pretty well. You find those seats mostly in the 1/2" j valves from the 50s. You will know if you have one because every time you stop breathing it will go "PING...."
You can do some useful dive planning too with a watch if you know your SAC rate. When Andy and I from VDH dove Panama City we both wore J valves, double hoses, and no SPGs. With a single tank if you are timing it for say 120 feet then you just plan the number of minutes of air you use at depth and ensure that you hit reserve shallower than 60 feet because a 300 PSI reserve will not get you back from 120 feet without running out of air, or at least it won't at my SAC rate. I have a laminated card where I've worked out all the numbers for single and double 72's for my SAC rate at various depths. You just stay the right number of minutes and ascend, pulling the J valve on the way up when breathing gets labored. If you plan it right you can even surface with gas in reserve. I will say that, once you figure out how to do dive planning with vintage gear, the SPG really just kind of becomes a nice to have. Really with vintage gear the only time I use an SPG is in Hawaii because none of the rental tanks have j valves or if they did I wouldn't trust them because God knows when they've been gone over last. - SeaRat has posted an extensive explanation over on the VSS using the Basic Scuba references... A typo using 10 ft instead of Roberts 100 ft depth confused me at first but I went back to the actual book and saw it was all for 100 ft depths. - I don't think it means the same as "depth compensated" but Roberts assertion is that the reserve at 100 feet will be the spring strength PLUS the additional ambient pressure at depth. So, a 300 psi single tank reserve would give 344 psi at 100 feet. - Additionally, a twin tank reserve with 500 psi spring on the surface would split to 250 psi per tank on the surface and give 294 per tank at 100 feet. - So yes, the reserve will give a little more air at depth but not nearly enough to offset the increased rate of air usage. - SeaRat's calculations say you'd be using air 3X faster at that depth. So, decanting and continuing the dive at depth won't give any significant additional dive time... I got 8 minutes on the first pull at 10 ft deep in the swimming pool. I'd probably only get a minute or two at 100 feet. And the 2nd pull (if I was still 100 feet deep) would only give 30 secs to a minute. Better start coming up on the first pull. I can not see how Roberts came up with that. There is no way water pressure can act on the spring. The stem of the J is just a cam that rotates that compresses the the spring or releases it. The stem can not move inward which it would have to do to increase pressure on the spring. Gotta side with Captain Tom on this one. The spring isn't exposed to the sea water directly via something flexible to exert more pressure on it either. The reason your first stage opens more at depth is because a flexible membrane (the first stage diaphragm say) is directly acted on by sea water in concert with the spring pressure that already existed. In the case of the J valve, the spring is completely internal to the valve, and is in no way acted on by the seawater. In addition, the container is rigid and therefore cannot be acted on by the ambient pressure either. Maybe we can ask Dave to chime in here. Dave knows a ton of mechanical engineering stuff. I don't think this works though. Granted, I am not this type of engineer. All that theory from Basic Scuba started to hurt my brain real quick, so I didn't think it completely through. I have a lot of respect for Roberts' great publication, but I have to think in simpler terms... so I disagree with him here, for now. Keeping an open mind though, and would be interested in hearing more on the subject. "I get plenty of excercise just pushing my luck!" I thought you and I had already answer this. I am sorry that my explanations are not always that clear. The only thing that is pressure compensated is the regulator, not the standard J valve. The only thing that Roberts is doing, is adding the effect of the pressure compensated regulator, to the effect of adding a 300 psi reserve J valve. The extra few breaths from the pressure compensated regulator is available with a “J” valve or a “K” valve. Roberts is just confusing the issue by only mentioning it when the regulator is used with a J valve.